Normally when I’m wrapping up a semester, cooking is the only thing I want to do. My home cooking routine invariably goes into autopilot during finals: I rely on a tried-and-true handful of simple recipes to get me through. As soon as my coursework is wrapped up, I dive back into cooking with creativity and relish. This semester is different. I’m looking forward to more varied meals, for sure, but my appetite for cooking is at an all-time low. This home stretch of grad school has felt particularly long, and when it’s over in a week I suspect I’ll want nothing more than to read and nap, when I’m not catching up on work. Somehow the thought of being in the kitchen isn’t drawing me in. Nothing wrong with any of this: I go through peaks and valleys with cooking and my enthusiasm for it, and I know that the kitchen always calls me home sooner or later. 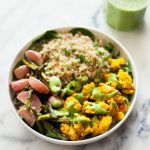 In the short-term, I imagine I’ll make a lot of simple food this summer, which will be a relief for me, and maybe for you, too? My impression has been that unfussy recipes are usually very welcome in this space. 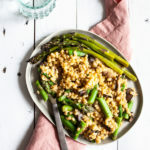 What I love about this vegan barley asparagus mushroom risotto is that it’s a stress-free recipe that has the look and flavor of something a little fancy. I made it last Wednesday night, after I turned in what I knew would be the last substantial assignment of my semester. I wanted to celebrate with a dish that wasn’t a bowl or a soup + bread combo as usual, but I didn’t want to spend a lot of time at the stove. 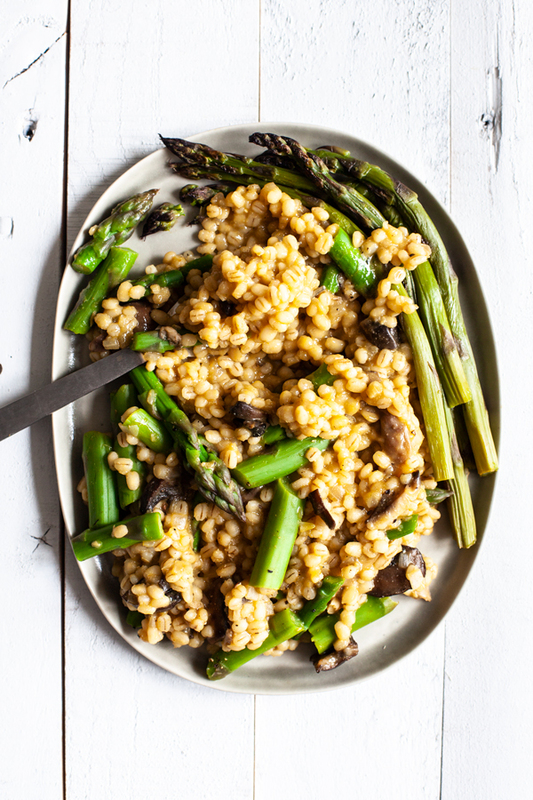 Regular risotto wasn’t an option, but I knew that a quicker barley risotto could be. And I was feeling inspired by the first crop of asparagus that I’d seen this year at my local farmer’s market. 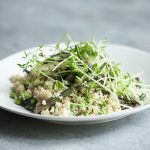 I used pearl barley for the recipe, which took about 30 minutes to cook. 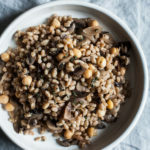 You can use hulled barley instead; just know that it might take 40-45 minutes to become tender. 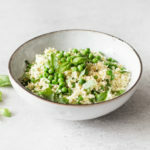 I loved the combination of chewy mushrooms and bright, tender asparagus, but you could omit the mushroom and add peas, or you could replace the mushrooms with leeks or carrots or another vegetable that you love. I kept the seasoning simple: a splash of white wine to start, lemon, shallots, garlic, and nutritional yeast at the end. Add the oil to a large, deep skillet or roomy pot (one that comes with a lid) over medium heat. Add the shallots and cook for 2 minutes, stirring often, or until the shallots are clear. Add the garlic and mushrooms, along with a generous pinch of salt. Cook, stirring often, until the mushrooms are tender and reduced in size and have released their juices (about 5-7 minutes). Add the barley to the skillet and stir everything well. Add the white wine. Cook, stirring every now and then, until the wine has been absorbed (3-5 minutes). Add 2 cups of broth to the skillet. Bring the mixture to a simmer, then reduce the heat to low and cover the skillet. Allow the barley to simmer for 20 minutes. Stir the barley, then add the remaining cup vegetable broth. Cover the pot and cook for another five minutes. Uncover and fold in the asparagus. Cover and cook for 5 more minutes. 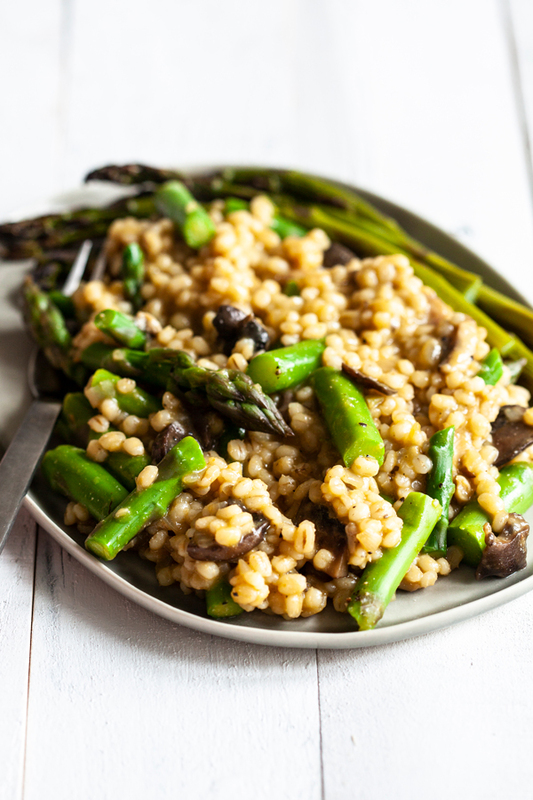 Taste the risotto; the asparagus should be tender and the barley should be toothsome but tender, too. If the meal needs a little more time (this may be true if your asparagus stalks are thick), stir in an extra splash of broth before covering the skillet again and giving it an extra five minutes. When the dish is ready, stir in the nutritional yeast and lemon juice, along with salt and pepper to taste. Serve, topped with walnut herb parm if you like! Sometimes it’s the smallest differences that spell the difference between a recipe that feels doable versus one that feels like a drag. I loved using shallots here because they cooked faster than onions, and that first, twenty-minute simmer of the barley—which didn’t demand any stove-side babysitting from me—gave me time to throw on sweats, respond to emails, and take care of other end-of-day stuff. Traditional risotto wouldn’t have been much more complicated, but this recipe was as much as I was in the mood for. It allowed me to satisfy my craving for a “special” meal while honoring my energy level at the same time. If you give it a try, I hope it’ll feel as doable for you as it did for me. And it’s such a lovely recipe for spring! I’ll be back on Friday to share another easy recipe—there’s some inactive baking time, but otherwise it comes together in a snap. It’s from my friend Ali’s new cookbook, and it’s perfect for summer get-togethers. Till then, be well. Love, love, love simple, easy, unfussy! Thank you! From an Italian woman: please don’t call it risotto!! it isn’t at all!!! 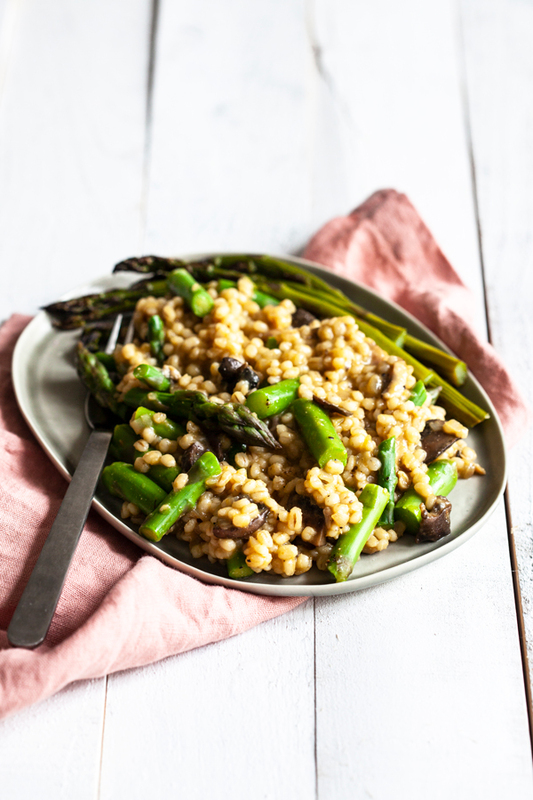 Barley has such a great texture it must be so amazing in this risotto Gena! Hope the end of your semester is going well! 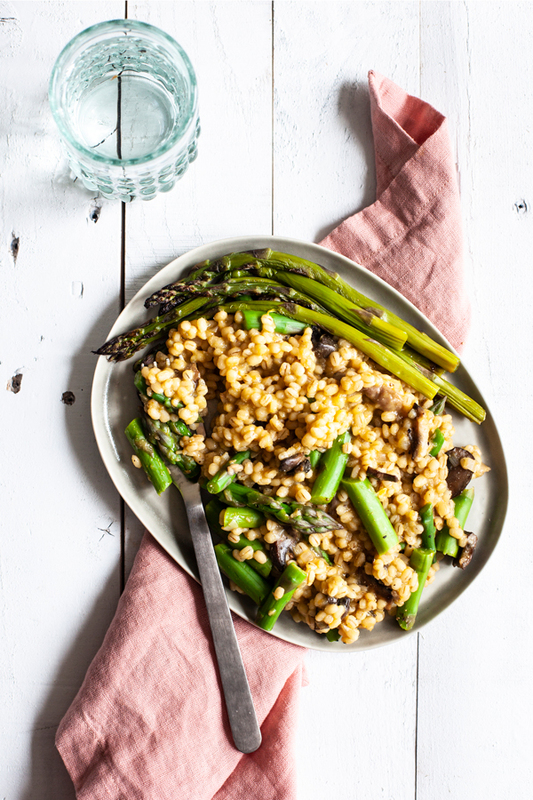 I love the use of barley to make for an easier and faster risotto! Looks delicious! I just found your blog and am excited to try so many recipes! I made this last night for dinner and it turned out great. Amazing how creamy a vegan risotto can be!